Uganda has got many attractions that can be enjoyed by the visitors when they come here for vacations, below are some of the attractions that are most visited by the visitors on self drive safaris in Uganda. Mountain gorillas; these are mainly found in Bwindi impenetrable national park and in Mgahinga national park. It’s the largest primates in the world not found in any zoo, but only in the heart of Africa and its Uganda that is home to over half of the mountain gorillas in the world with 480 and 80 of these live in Mgahinga National Park. Mountain gorillas are on the bucket list for many and in Uganda, you can make that dream true on a gorilla trekking safari where you are one hour with a gorilla family. 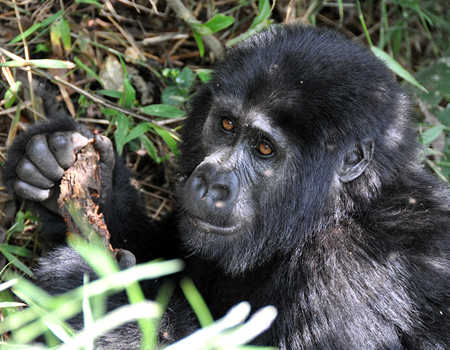 You can as well spend 4 hours with the gorillas which is called Gorilla Habituation experience. Gorilla permits in Uganda are sold at $600 per person and for gorilla habituation; the permits are sold at $1500 per person. Chimpanzee trekking; Uganda has got more chimpanzees than any east African country, these are about 5000 and 1500 of these are found in Kibale National Park, which is the capital of East Africa with 12 species of primates and the best chimpanzee trekking in the region. You can either go on a one hour trek or decide to spend a whole day with the chimpanzees on a chimpanzee Habituation Experience. The Permit costs are 150 USD for Chimpanzee Trekking or 1,500 USD for the Chimpanzee Habituation Experience. Chimpanzees can also be trekked in Kalinzu forest where there is 95% success rate and the permits are at $40 without entrance fees. Source of River Nile; Uganda is home of Lake Victoria source of the Nile in Jinja, this is East Africa’s adventure capita where some of the best white water rafting, Kayaking , bungee jumping is found. The white water Nile flows north through Uganda to the Mediterranean sea. Apart from Jinja, you don’t want to miss the sight of Nile plunging down the western Rift Escarpments at Murchison Falls which is, the most powerful waterfall in the world and as you take hike up along the falls you will feel the ground wobbly from the force of the powerful River. Kidepo Valley National Park; The remote and unvisited national park received an accolades like being named the number one destination by wanderlust, CNN travel called it the 3rd best national park in Africa. It’s also been called a lost Eden to us, its African as it used to be, as you might imagine it. You get to experience many buffalo herds, giraffes, lions, leopards, cheetahs, zebras, Rothschild giraffes, ostriches and many more. the park is home to not only the scenery and wildlife but one of Cultural discoveries like one of the most ethnic groups in East Africa, the Ike people high on Mount Morungoole where the only road is a footpath and the Karamojong tribe, which is a normad tribe. The Golden Monkeys; these are found only in Virunga volcanoes which is located in Uganda in Mgahinga Gorilla national Park in the south west corner of the country. Uganda has the most Golden Monkeys and many groups are open for visitation. You can go on a longer Golden Monkeys Habituation adventure. The experience of being in their presence in the Bamboo forest of the Volcanoes in so amazing. They will be all around you and these are quite great. This is an endangered species and of the issues is that they are not reproducing enough and their numbers are slowly declining. They are also not to be confused with the Chinese Golden Monkeys which are totally different. The other attractions in Uganda that can be enjoy on yourself drive tour include; the tree climbing lions in Ishasha sector of Queen Elizabeth, Rhino trekking in Ziwa Rhino Sanctuary, the Endangered Rothschild Giraffes in Africa, the Elusive Endangered shoebill stork, and the Batwa Pygmies.